Orson Welles moved on from his magnum opus (hint: “Rosebud”) to something completely different from any other noir I’ve ever seen. The Third Man is a stunning collaboration between the great Welles, director Carol Reed (known for the Oscar winning Oliver! ), the novelist Graham Greene as the screenwriter and finally…who can’t forget Anton Karas as the writer and performer of the score, his weapon of choice being the very Austrian zither. This is a film which was way ahead of its time just like the German expressionists of the 20s, Fritz Lang is an obvious auteur with his experimental use of sound in M.
The Third Man concerns an American pulp novelist named Holly Martins (Joseph Cotten) who arrives in Allied occupied Vienna seeking his old friend Harry Lime (Orson Welles) who has offered him a job, only to discover that Lime was killed by a car whilst crossing the street a few days before. The question is…how did Lime really die? This is the question which prompts Martins to investigate into Lime’s business all while the Brits tell him to clear off back to the States and Harry’s girlfriend Anna (Alida Valli) remains suspicious of Martin’s actions. Martins soon discovers dark secrets about Lime’s line of work and his death. Where do I start to emphasise how beautiful this film is? Well, firstly the cinematography by Robert Krasker is possibly one of the best examples of camerawork I’ve ever seen! Krasker frequently uses the Dutch angle technique, whereby the camera is tilted off to one side, offering to the audience Martin’s alienation in a foreign environment. The use of this expressionist technique really reminded of the great German horror The Cabinet of Dr. Caligari and the unease that it created as much as The Third Man. The performances are also outstanding and should be greatly admired, Cotten and Valli portray two foreigners struggling to survive, one with a desire to discover whilst one with desire to remain silence. Welles doesn’t enter the film until roughly an hour in, but when he does, it’s probably one of the greatest entrances in all of cinema. I won’t go into detail (my apologises in advance!) but you just have to see it for yourself, there is perfect use of cinematography, mise-en-scene and lighting! It all works so well within that scene, I was simply amazed at how the crew captured the sense of surprise within Cotten’s fantastic performance. Welles of course offers a very sinister yet stunning performance as Lime who reveals much more than one can really handle to the true purpose of his work if you can call it that! The music by Karas is without question one of the best examples of film scoring because it’s just so simple and fits in with the setting of post-WWII Vienna, offering a jangled sense of desperation which is repeated throughout the film as the theme of Lime. 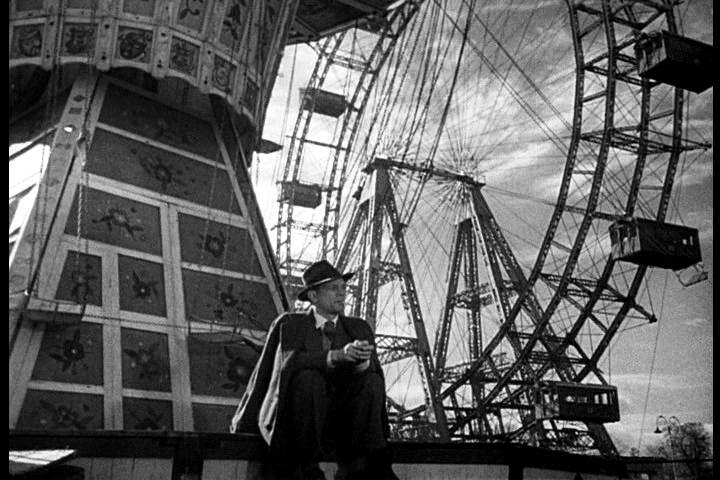 A very pleasing film, The Third Man remains thrilling today as it was 64 years ago and is certainly one of the prime examples of film noir! This is an incredible film. Well done on this.